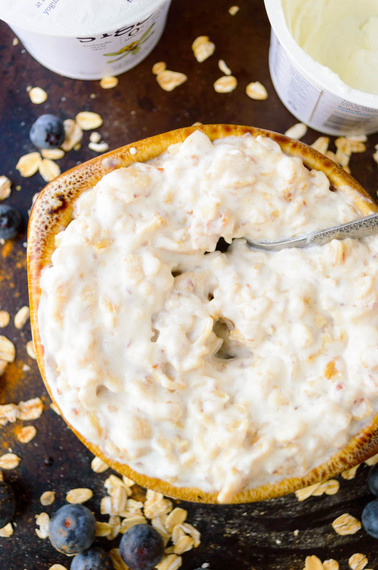 This how-to breakdown of CREAMY oatmeal is super simple and you can play it up however you want as long as you stick to two of the basics: Milk and Vanilla Yogurt. These are essentials to make your oatmeal the dreamiest creamiest breakfast bowl. 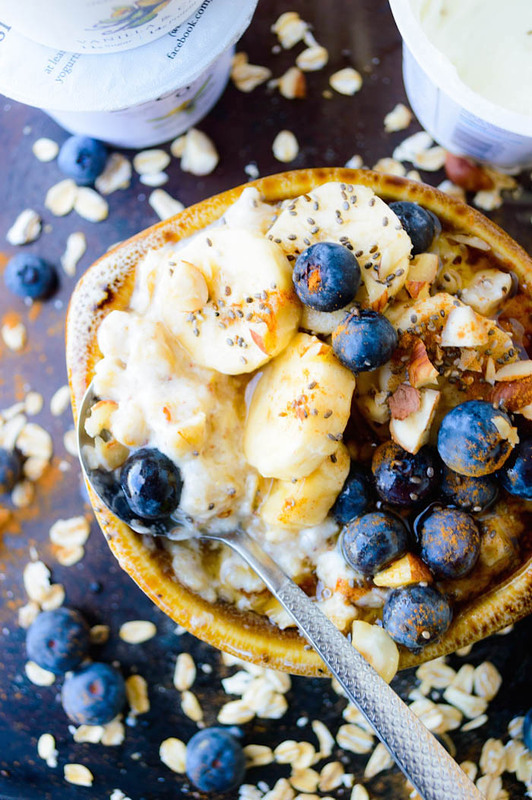 It's no secret that oatmeal is the bees knees to breakfast in this trendy health world of ours. My love for oatmeal is an understatement. I adore the stuff. Probably not as much as I adore pancakes with crispy bacon and maple syrup but that's when my romantic mood strikes. Oatmeal can be an everyday kind of breakfast, but not in the boring way. It's super cozy and has this feel-good effect. Exhibit A) Oats. I like to get rolled oats, multigrain oats, steel-cut or quick cooking via Trader Joe's because let's be real. Time is money. 1-minute oatmeal made in the microwave = fine by me. Exhibit B) Milk. I always buy almond milk or cashew milk because it's easy on my stomach and it's what I'm used to. Any milk will work though. You're going to need about 1.5 cups and please do NOT use water. Remember we want creamy dreamy oats, not a bland bowl of watery oats. Exhibit C) Vanilla YOGURT. Vital component. Think protein. Substance. Filling. CREAMY. 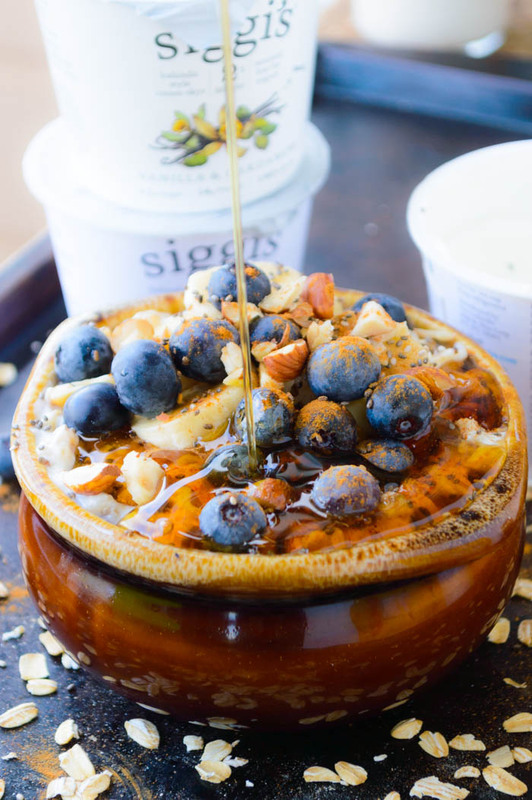 You're going to mix in vanilla greek yogurt or my favorite: Siggi's Icelandic vanilla bean yogurt into your oats after you cook them. Exhibit D) Chia Seeds + Cinnamon + Maple Syrup. Okay so this doesn't pertain to the creamy aspect but these are great additions to actually make your oatmeal tasty. Exhibit E) Fruit/Toppings. This is where you get creative. 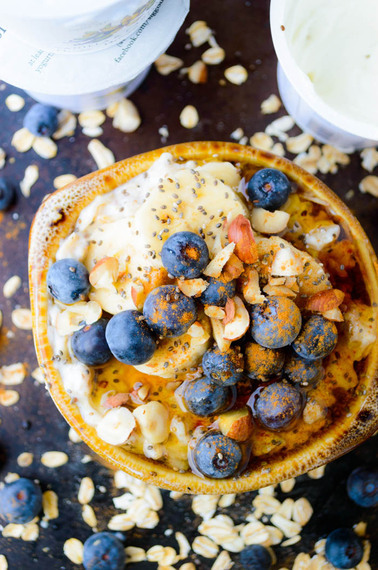 Bananas, berries, apples -- whatever it is, you do you. Slivered almonds or nut butter are essentials for me and add more substance to my bowl of oats. Plus look how pretty! Fruit: berries, bananas, apples, etc. Bring the milk to a boil and stir in your oats. Bring back to a boil, then lower the heat and continue to cook/stir the oats until cooked (about 5-10 minutes). Take off heat and stir in cinnamon, sea salt and maple syrup. Then stir in your yogurt until creamy. If oatmeal seems dense, add in a little more milk until a creamy mixture forms. Add in your optional additions, top with fruit of choice and any additional toppings.